From Painted Teeth to water bottle curls, this year had some interesting ideas about beauty. Today we’re counting down the most watched and most talked about beauty trends that went viral this year! This beauty trend took over the internet showing ladies curling their hair with water bottles. To do the trick, cut a hole is the bottle and feed a strand of hair through. Point a blow dryer into the bottle and pull the strand out to reveal a perfect curl. Or at least, that’s what it’s supposed to do. Unfortunately, not everyone got those results, which is perhaps why the trend went viral. This brow trend swept across social media after one user decided to use photoshop to turn the first part of her brow upside down. Soon after, many beauty bloggers figured out how to do it IRL, and thus fishtail brows became a thing. By employing brow filler and concealer, these bloggers were able to turn themselves into mermaids. Speaking of weird brows, check out this trend called “Halo Brows” . Started by the same girl who did Fishtail brows, halo brows are just as weird. Tons of people took to social media to post their own versions of this bizarre trend, but these halos aren’t very angelic. 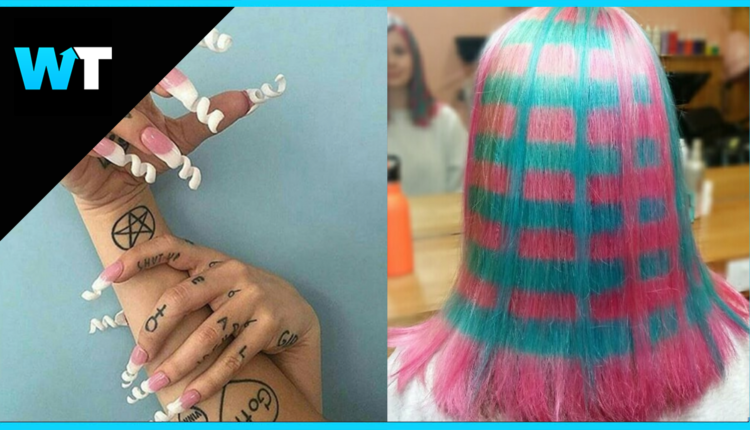 This trend took over instagram replacing pinkie blush with neon yellow. And even though this is a wild idea… some people were actually able to pull it off. The look gives a more editorial look for photos, but I’m not gonna be trying this one myself any time soon. These acrylic nails are shaped and dried, and when they’re done, you’re ready to not be able to hold anything for a while. Can you imagine trying to type or text? Now this next nail trend is much more functional but just as weird. Expecting mom have now started having their baby’s ultrasounds painted on their nails, and even though this is kind of bizarre, you have to hand it to thee nail artists… Just look at how intricate these details are! And you know those moms would be mad if you messed that up. This hair style is so intense. First, the bottom of your hair is shaved to look like fish scales…then the hair artist paints is silver and.. voila! you have fish scales on your head…yay!! But you don’t have to be limited to silver…you can also use fun rainbow colors, and be a rainbow fish! So.. I did a thing today?? Shoutout to @kristinacheeseman for being AMAZING? Check out this part, that uses all the wonderful colors of the rainbow, and I”m not gonna lie this is actually pretty cool. 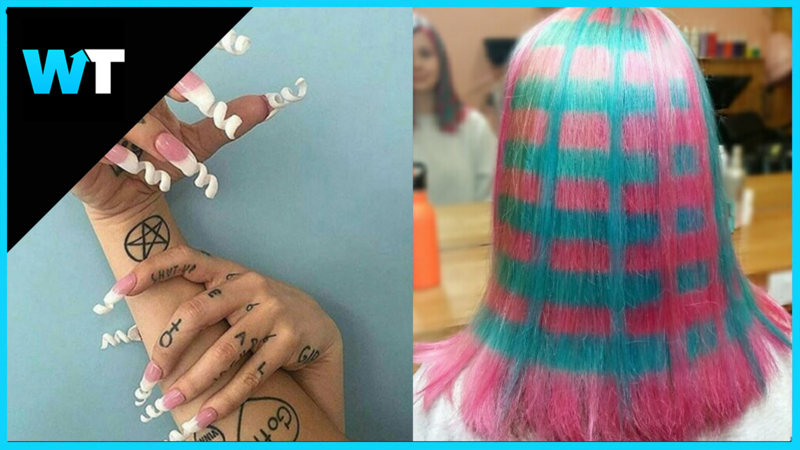 This trend doesn’t turn your whole head into a rainbow, just your roots. The process is pretty extensive, but the results are very mermaid chic.. These softer colors are much more subtle, and are giving more an an icy mermaid unicorn vibe.